How to draw a baby kitten cute and easy. 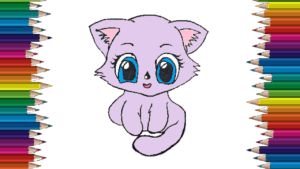 Kitten cartoon drawing easy with this how-to video and step-by-step drawing instructions. Easy animals to draw so cute for kids and everyone. The first thing you will do is make a big circle for the kitten’s head. Then you will draw an egg shape that will be for the body. Add face guidelines and then move on to step two. Slowly draw the shape of the kitten’s face. This includes temples, cheeks, jaw, and chin. Here you will draw the top of the head, and then draw out the shapes of the ears. Draw the separating lines for the ears, and move to step four. Draw the big shapes for her eyes, and then draw in the eyeballs. When you are done you have to thicken the lining for the lids. All you will do here is draw out the eyebrows, ad then draw in the heart shaped nose. To draw the body all you have to do is draw the front leg and be sure to add a small feather along the inner lining of the leg. The last step you only need to do is to pull your hind legs in a sitting position, then pull the tail curled in front of your foot. Now look at your cute kitten. All you have to do is follow a simple guide, and now you have yourself a brand new kitty that will be yours forever. Finally color your cat as you like. I painted blue eyes with pale pink hair.